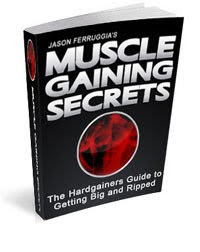 Written in a straight forward, easy to understand manner, Muscle Gaining Secrets provides the road map to success which can instantly be applied by anyone. This book is primarily directed towards “hardgainers,” but everyone spinning their wheels with the generic high-volume muscle magazine-esque pump-routines would be well off reading this. Basic weight training information and the stuff that really matters if you want to add muscle. Great narrative interspersed with various anecdotes. A joy to read. Not bogged down by minutiae and hyperbole. Tells it like it is. Covers a wide spectrum of weight training and performance tops, including everything from exercise selection, rest periods and periodization to recovery techniques and training music. Includes a comprehensive list of the most useful exercises for various muscle groups, which is handy to have when composing routines. Great common sense advice all the way through. Ferruggia ranks the most effective types of exercises being the ones that “involve moving the body through space” (i.e. gymnast rings) followed by compound movements and isolation movements. Can’t say I agree with that and he doesn’t really talk about that first type of training in the book. One wonders why he bothered to write a book about weight training if he believes body weight training is more effective (it’s not). Body weight training seems to be one of the themes in his most recent book Triple Threat Muscle, though I’m not quite sure since I haven’t read it yet. Covers many methods for strength and muscle gain, such as various periodization protocols and intensity techniques. This might paralyze the reader because there are too many options. When Ferruggia lists training splits he also leaves exercise selection up to the reader. Before Ferruggia went crazy and started advocating vegetarian diets (!) he wrote this solid book on muscle gaining. This is a good and comprehensive book with many similarities to Stuart McRobert’s Beyond Brawn which inspired my own training methodology. Like McRobert’s classic, Muscle Gaining Secrets is full of good advice and pointers on how to put on muscle. It covers just about every important aspect of the iron game. It’s a great starting point for the new trainer, or the ideal reset button for the person caught up in the minutiae of training. Some may consider the lack of scientific references a weak point, but I don’t. Beyond Brawn didn’t have references and that book made a huge difference to me. Another improvement over Beyond Brawn: Ferruggia doesn’t get quite as repetitive as McRobert did. The only weak point in this book is the lack of concreteness regarding specific training splits. Some may disagree because Ferruggia gives you the option to personalize your routine a bit. But in my experience, this could lead a beginner to mistakenly mixing together the wrong exercises. I can easily recommend this book with a straight face. Along with Beyond Brawn and Starting Strength Muscle Gaining Secrets is one of the best books on weight training directed towards the layman.